The Dashboard provides a complete overview for your business, your clients, your payment collections and key business metrics and indicators. 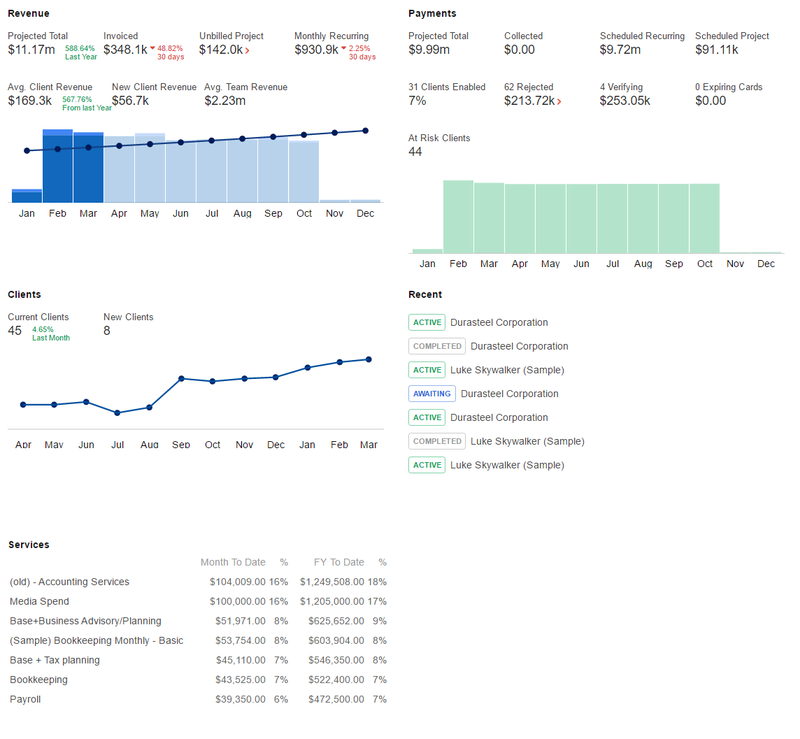 The Dashboard provides unique business insights to help you build an efficient and profitable business. Revenue - Provides visibility over the revenue already generated from active proposals as well as forecasted amounts for the current financial year. Payments - Provides visibility over payments that have already been collected and are expected to be collected for the current financial period. Pipeline - Lets you track how many of your proposals are being accepted by your leads and existing clients. Clients - Provides instant visibility over your active client count over the last 12 months. Recent - Shows a list of proposals that were recently created or updated. Note: Click on the panel names above to learn more about them! The Dashboard requires very little initial setup. Most panels are self contained and where applicable, have their own settings that can be viewed by hovering over the panel and clicking on the settings cog at the top right. One setting that you will want to set is your Company Financial Year. The can be set in Settings > Company Settings and this value will define what months the Revenue and Payment panels display.